ABOUT US - River Valley Window Co. Overall Excellence. Leadership in the Professional Market. As your local Window Specialist and Milgard Certified Dealer, we are proud to help you create the home you and your family deserve. A visit to our beautiful showroom will allow you to experience why so many of your neighbors have chosen River Valley Window Company for their window and door needs. River Valley Window Co. is a family- owned and operated business. We have worked with families for over 15 years to meet their window needs. We strive to carry the very best products from the brands you trust most. Our number one priority is our customers, which is why we focus on their budgets, needs, desires and wants. River Valley Window Co. has been serving the builders and homeowners since 1999. 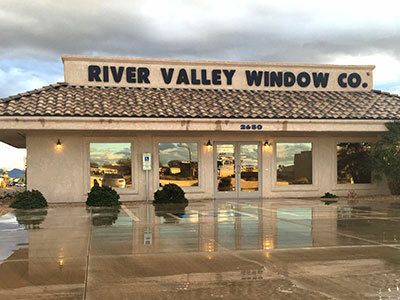 As a family owned and operated business , River Valley Window Co. has been Western Arizona and Southern California premier source for a huge selection of high quality windows. At River Valley Window Co. the process costs a fraction of what you would expect to pay. River Valley Window Co. uses the best energy efficient glass on the market, so your energy savings should be substantial.